What is the founding date of New York? A seemingly obvious answer is: AD 1664, when the former Dutch colony of Nieuw Amsterdam gave in to the threatening guns of the English Royal Navy and was re-named after their new owner James, the Duke of York, and after the city which was his seat of power. This is, however, not the only possible answer. A less obvious but equally correct answer is: which one of them? In Iceland, there are four settlement sites that answer to the name of Jórvík – and all of them probably are Viking Age foundations named after the Old Norse name of York: Jórvík. So basically, there are four ‘New Yorks’ in Iceland. They may be a bit smaller than the city on the American East Coast: the Jórvík in Skaftárhreppur in Southern Iceland today consists of barely a dozen buildings, even if one includes agricultural outbuildings in the count. Yet nevertheless, new Yorks these settlement sites are: places named after the ‘old’ York in northern England by Scandinavian settlers who had moved westwards across the Atlantic. The broader context of the foundation of the four Icelandic ‘New Yorks’ is found in the history of the Norse westward expansion during the early Middle Ages. Iceland was discovered in the middle of the ninth century and was subsequently settled between c. AD 870 and AD 930. Yet neither the discovery nor the settlement of Iceland were isolated occurrences. With the beginning of the Viking Age in the late eighth century, the Norse began to push the borders of their settlement territory to the west: northern England; the Scottish mainland; Shetland; Orkney; the Western Isles of Scotland; Ireland; the Faeroes; and finally Iceland, Greenland, and even a bit of Newfoundland were all settled by Norse incomers. Of the Norse that came to these lands west of Scandinavia, some came to raid, some to trade, and some to stay; and of those who had come to stay, some after a while ended up moving even further west. Or in other words: while the first generation of settlers in newly-discovered Iceland was dominated by men (and very, very few women) who were ethnically Norse, not all of these early settlers had come to Iceland directly from Scandinavia. If our medieval textual sources are to be believed, about a quarter of the earliest Icelandic settlers came to Iceland only indirectly: from Scandinavia, these settlers originally had moved to Britain or Ireland and decided only later on that maybe there were greener pastures to be found even further west. So, some of them then continued their move westwards by setting sail for Iceland. At least part of these ‘indirect’ settlers, who went to Iceland via Britain or Ireland rather than directly from Scandinavia, spent several generations in their first host countries before finally moving on to Iceland. Such extended stays meant that some of them, at least to a certain extent, went native in northern England or the Gaelic-speaking world, even to the point where some were on the brink of losing their linguistic identity. A certain Auðun, for instance, who had come to Iceland from the Hebrides (where his father had emigrated to) and who was married to an Irish wife, was nicknamed ‘the Stutterer’: since Auðun seems to have grown up on the (Gaelic-speaking) Hebrides and there had been integrated enough into Gaelic society to have an Irish spouse, this ‘stuttering’ may not so much be a speech defect but rather the reflex of an inadequate grasp of Norse by somebody who ethnically was Scandinavian, but who had culturally and linguistically grown up in and into a Gaelic environment. When such settlers came to Iceland, their reference-point for what was ‘home’ might not have been Scandinavia, but rather the place where their family had last lived: northern England and the Gaelic-speaking world of Ireland and Scotland. Just as in the case of the Dutch settlers of Nieuw Amsterdam and the Duke of York, a first step for such settlers to make themselves at home in the new land could have been to name their new settlement after their old. Thus, Norse settlers from Viking York – Jórvík – might have given their new farms in Iceland just that very name: Jórvík. (New) York. At a close reading of Old Norse-Icelandic and medieval Irish literature, it turns out that this focusing on an old ‘home’ in Britain or Ireland is relevant not only for the history of the settlement and place-names of Iceland, but also for important parts of medieval Irish storytelling. A well-known instance is the story of how Auðr the Deep-Minded had crosses erected at her settlement site on the Hvammsfjörður fjord, thus creating both a place for her prayers and the place-name Krosshólar, ‘Cross Hills’. Today, this is memorialised by a stone cross on the rock outcrop of Krosshólaborg on the north-eastern tip of the fjord. In scholarship to date, Auðr’s ‘Cross Hills’ have mostly been seen as a calvary hill. Yet it may not be chance that, according to her story as told by medieval Icelandic literature, Auðr’s home before her emigration to Iceland had been the Gaelic-world of Ireland, Scotland, and the Scottish Isles – a world where High Crosses were among the most prominent monuments visible in the religious landscape. Maybe Auðr did not simply create a calvary hill, but rather – and much more poignantly – turned her new settlement place into a facsimile of the landscape in which she had grown up and which for most of her life for her had meant ‘home’. The rock outcrop of Krosshólaborg on the north-eastern tip of the Hvammsfjörður fjord, crowned by a stone cross erected in 1965 to commemorate Auðr as the first, Christian settler at Hvammur, who reputedly erected High Crosses in this area already in the Settlement Period. © M. Egeler, 2011. Similarly, ever since Ari the Wise in the twelfth century wrote his ‘Book of Icelanders’, the papar have loomed large in the cultural imagination of early Iceland: fabled Gaelic anchorites who were thought to have reached Iceland even before the Norse did, only to abandon it when the island was taken over by pagan settlers from Scandinavia. The ‘Book of Icelanders’ or Íslendingabók makes much of them, and so does the ‘Book of Settlements’ or Landnámabók. Yet if one has a close look both at the Icelandic and at the Gaelic material – stories about saints, place-names, and the Latin writings of the Irish historian Dicuil – it turns out that another scenario is much more likely than an early settlement of Iceland by Irish monks. Norse settlers coming from the Gaelic-speaking world (especially Scotland and the Scottish islands) seem to have brought the idea of papar-places to Iceland because in their old home on the Hebrides, such monastic places were what had made up the sacred landscape. The papar came to Iceland not physically, but as part of the cultural imaginary of partly-Gaelicised settlers who tried to feel at home in Iceland by turning Iceland conceptually into a mirror-image of their old home in the Gaelic world – almost a ‘Nova Scotia’ or a ‘Nova Hibernia’. Papós (‘papar-Estuary’) at the mouth of the lagoon of Papafjörður (‘papar-Fjord’) in southern Iceland: a place whose names evoke imaginary Gaelic anchorites and thus the sacred landscape of northern Scotland and the Scottish islands. © M. Egeler, 2014. Even heroic landscapes were affected in this way. One of the most famous of the Sagas of Icelanders is Eyrbyggja saga, the ‘Saga of the Inhabitants of Eyr’. Much of the main narrative of this saga is framed by the story of Þórólfr Twist-Foot, who may well be one of the most interestingly evil characters of Icelandic saga literature. Having been a ‘great Viking’ (i.e., a robber and raider) before his arrival in Iceland, he behaves as a violent, unfair bully even after he has settled down there. The older he gets, the worse his bullying becomes, and this trajectory is even continued after his death: soon after his burial, he returns from the grave as a viciously destructive revenant whose hauntings threaten to turn the whole area into a wasteland. When his son intervenes and moves the body to an outlying headland, there is peace for a while. The terror returns after the death of Þórólfr’s son. Þórólfr resumes his hauntings with such ferocity that one farm after another has to be abandoned. To stop him, the new local landowner disinters the body and burns it. Yet then a cow licks the stones where the ashes from Þórólfr’s pyre had been blown, and Þórólfr returns through its womb: the cow gives birth to a calf and Þórólfr is reborn as a magnificent, violent, terrible bull who ultimately kills his owner and ends his life by disappearing in a swamp. The swamp is then named Glæsiskelda. This name is a linguistic game that both plays with the imagery of water and light, as the name can be translated as ‘Shining Spring’, and takes up the name of the bull, which had been called Glæsir. The same pattern that is found in the saga narrative also is well-known from medieval Irish storytelling. Among the main protagonists of the Ulster Cycle of Tales, the main heroic cycle of early medieval Irish storytelling, are two magnificent bulls. Originally, these bulls had been men from the otherworld who underwent a series of transformations. Towards the end of this series of transformations, they turned into two water-worms. As water-worms, they were swallowed by two cows. From this, the cows had calves. They gave birth to two magnificent, violent, terrible bulls, which in the end tore each other to pieces. In their final fight, these bulls created the place-name Áth Lúain. This place-name, just like the place-name Glæsiskelda, represents a linguistic game that plays both with the imagery of water and light and with a body part of one of the bulls from which the place reputedly is named: it can mean both ‘Ford of Brightness’ and ‘Ford of the [Bull’s] Loin’. Thus, the stories from the Icelandic saga and from Irish heroic storytelling present the same patterns, and even the same details. In both narrative traditions, a being, at the end of a series of transformations, is turned into something tiny that is swallowed by cows. The cows then give birth to monstrous bulls. The lives of these bulls end in a hugely destructive fight, which leads to the creation of a place-name that plays both with the imagery of water and light and with [body parts of] the bulls themselves. In the ‘Saga of the Inhabitants of Eyr’, the story of Þórólfr Twist-Foot and his bull-transformation is closely connected with the topography of the Álftafjörður fjord. Step by narrative step, the saga connects the plot with local place-names, culminating in the creation of the ‘Spring of Brightness’ Glæsiskelda – which one can still locate on the official maps of the area. It is almost as if an Icelandic fjord had been turned into a Gaelic heroic landscape. One wonders whether what we see here is something quite similar to what we see in the four Icelandic New Yorks: a settler looking at his new land and trying to turn it into a facsimile of his (or her) old home. This can be done by transferring names from the old home to the new, but, in a much more elaborate way, it can also be done by transferring whole stories. 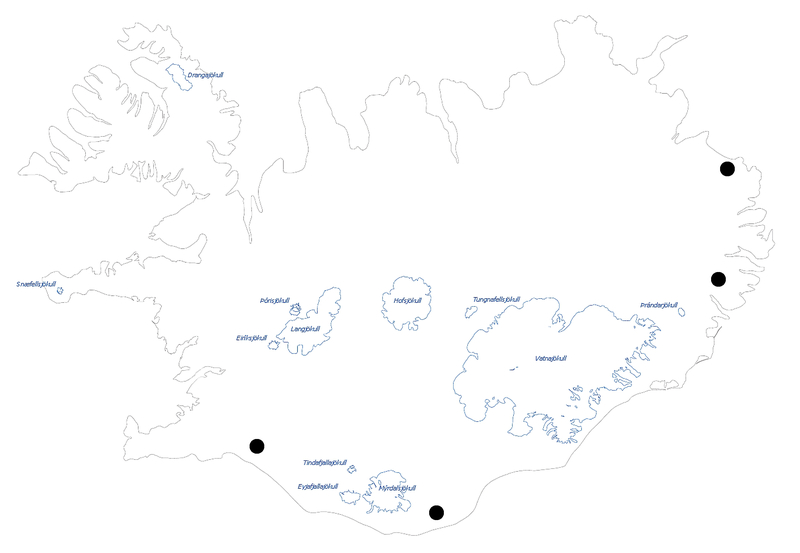 In this way, the connection of the settlement of Iceland with Britain and Ireland seems to have instilled an element of Gaelicness into the Icelandic sense of place. When looking at their new land, part of the settlers of Iceland apparently still yearned for a home located in Britain and Ireland, and tried to bring it with them, be it in the form of High Crosses, imaginary hermitages, men-turned-into-bulls, or the name of York. Matthias Egeler holds a Heisenberg fellowship at the Institut für Nordische Philologie of the Ludwig-Maximilians-University in Munich and is Fellow at the Wissenschaftskolleg zu Berlin. He is the author of Atlantic Outlooks on Being at Home: Gaelic Place-Lore and the Construction of a Sense of Place in Medieval Iceland, published by the Finnish Academy of Science and Letters. Click here to learn more about the book.